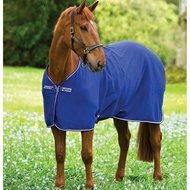 The Amigo Jersey pony is a polyester blanket with a classic design. 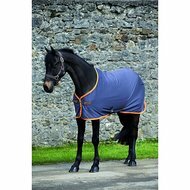 This cooler effectively transports moisture but also keeps the horse warm. 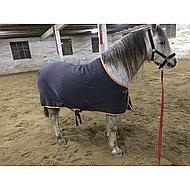 The blanket has a single hook / eye chest closure, detachable cross surcingles and a leg strap. 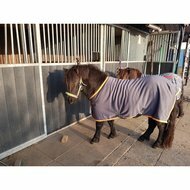 The blanket suitable as sweat, transport, stable and show blanket. Fits perfectly with the matching Amigo accessories. Nice blanket for the pony. A nice blanket and a good fit for the ponies of us. Nice light weight blanket with detachable cross surcingles, really handy. Only big downside is that the blanket is very static. Beautiful blanket, good fit, detachable cross surcingles. I have them printed and use them for the matches, super happy! Very nice blanket, good fit, detachable cross surcingles. I have them printed and use them for the matches, super happy! Question: How long is this blanket? So the length from the restorer to the knees? Answer: The blanket is in the size 100/150 about 80cm long, measured from the withers from. Question: Is the blanket waterproof?